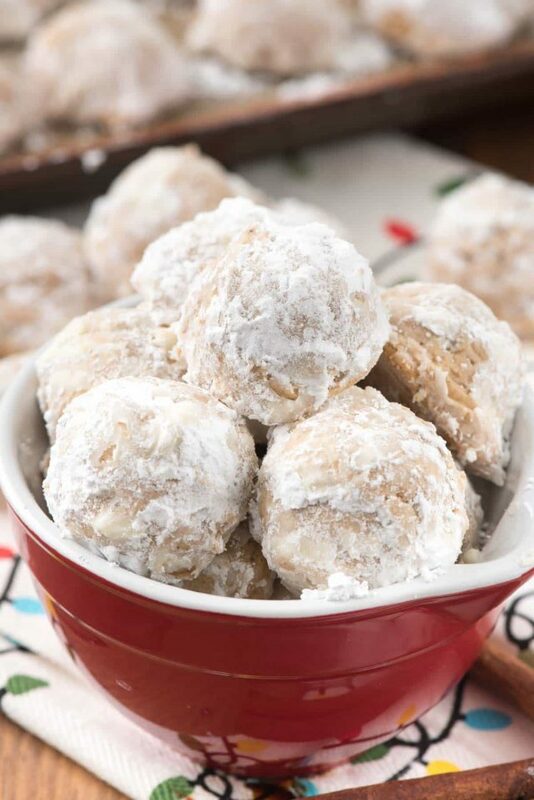 Gingerbread Snowballs – this easy snowball cookie recipe tastes like gingerbread! It’s the easiest holiday cookie recipe and perfect for giving. It combines two family favorite traditions: gingerbread and snowball cookies. 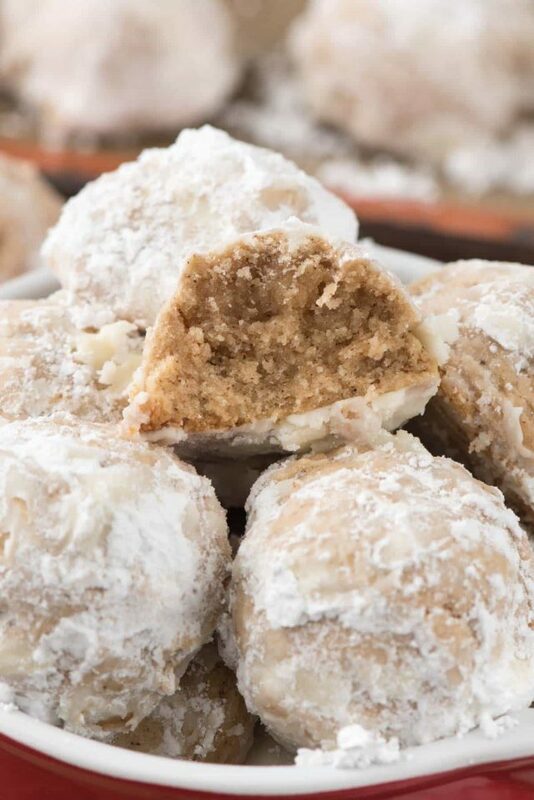 Whether you call these snowballs or Russian Teacakes, Wedding Cookies or Butter Balls, they’re the same recipe…and they’re SO GOOD. Thanks to Challenge Dairy for sponsoring this post! You knew these were coming, right? Or maybe you had an idea that snowballs were coming but weren’t sure what flavor? If you’ve read this blog for any length of time you’ll know I’m a collector of snowball recipes. I love making them all year long, but especially at Christmas. When I was younger we made these cookies but they were called Russian Teacakes. Come to find out, as an adult, that Russian Tea Cakes and Snowballs are the same thing. Same goes for Wedding Cookies (aka Mexican Wedding Cookies), Pecan Balls, and Butter Balls. They’re all pretty much the same cookie recipe with a different name. I’m pretty sure the names are either cultural or regional. My favorite nut-free snowball recipe replaces the nuts with mini chocolate chips. That’s the most popular cookie recipe on this blog. And then there are my pumpkin spice snowballs, which in design are very much like this gingerbread version. Those are the most commented on cookie recipe. These Gingerbread Snowballs are perfect for the holidays. They are a traditional cookie with a hint of spice and they taste like Christmas. I added a hefty dose of gingerbread spices to the cookie, along with molasses for that telltale gingerbread flavor. If you’ve ever wondered abut gingerbread spice, it’s a real thing. They do sell it at the store but it’s easier just to have spices on hand to make your own mix. I follow the ratio of 4:2:1, that is, 4 parts cinnamon to 2 parts nutmeg and ginger to 1 part allspice and cloves. I know I see some recipes out there that don’t include the cloves and/or allspice but I love using them. Just opening that jar of allspice makes me think about the holidays. As always when you’re making a recipe with so few ingredients, you have to make sure they are good quality ones. One of the other names for this cookie recipe is a Butter Ball because the majority of the cookie is just that: butter. Therefor you want to use a good quality butter, one that tastes good and performs well. 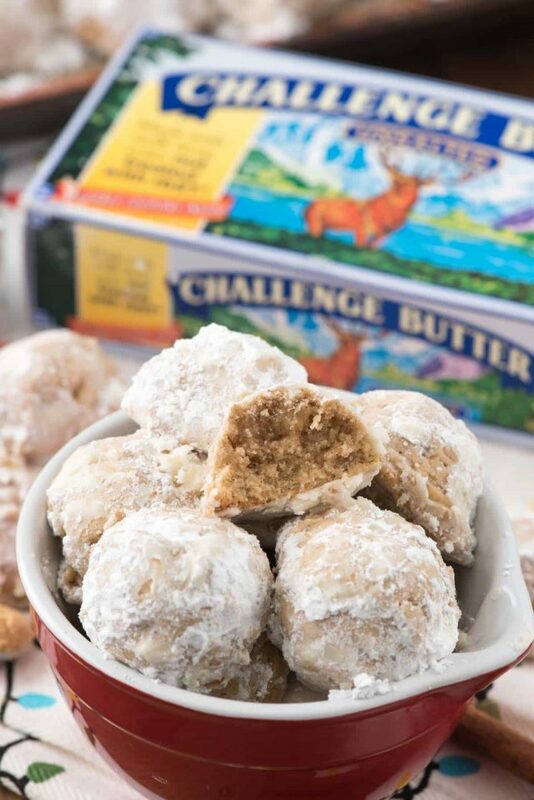 I use Challenge Butter in all my baking recipes – it’s made from real cream and real ingredients and nothing artificial. 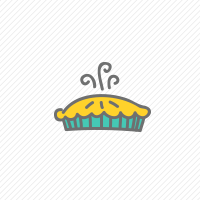 It’s also a California company, and I love using local products whenever possible. I grew up on Challenge Dairy and I’m glad that I can share recipes with you using their ingredients. Good news: it’s now available nationally! Find a store near you here. Look for the package with the elk on it! Gingerbread Snowball Cookies are an easy cookie recipe for Christmas! With just a few ingredients they come together fast are perfect for your holiday cookie platters. If you love molasses or spice cookies, then this cookie recipe is the one for you. Be sure not to pack your flour or your powdered sugar. Doing so throws off the balance of these delicate cookies. Softened butter is easier to work with and causes less of a mess when stirring. The best way to soften butter is to leave it at room temperature for an hour or two, but in a pinch you can heat in the microwave on 50% power in 10 second increments until it’s the softness you want. The mixture takes awhile to turn into a stiff cookie dough, but it does happen. It’ll get crumbly and seem like it’s never coming together but it will, just keep mixing. A stand mixer does this fastest, but if you’re using a hand mixer or stirring by hand it will take a long time. Gingerbread Snowballs - this easy snowball cookie recipe tastes like gingerbread! It's the easiest holiday cookie recipe and perfect for giving. Mix butter with an electric mixer until fluffy. About 20 seconds. Add powdered sugar, vanilla, salt, cinnamon, ginger, nutmeg, allspice, cloves, and molasses and mix until mixture is smooth. Add flour and mix until the dough comes together. This will take time. It will look like it won’t go beyond a crumbly mess but it will form into a cookie dough if you keep mixing. I can take a few minutes. Scoop 1 tablespoon of dough and place on prepared cookie sheet. Check out all my snowball recipes and a ton of snowball recipes from your favorite bloggers! I can’t wait to try Pistachio Snowballs or Peanut Butter Snowballs either! I also especially love my Chocolate Chip Snowball Cookies, Lemon Snowball Cookies, and Chocolate Dipped Snowballs! Cake rolls and snowballs are your two specialties! I think you have them in all the flavors 🙂 I would love this gingerbread version because I adore gingerbread things…it’s the molasses! No eggs, which means you can eat it raw!!!!! I made this recipe today. It was easy, came together quickly and tasted great. These are truly melt in your mouth cookies. If there are any left, they will probably taste even better in a few days. I will be making your recipe again as these were so good and epitomize the holidays to me. Thank you for sharing! These look both yummy and easy! We have our work Christmas party this Wednesday, so a recipe that makes so many cookies so easily is right up my alley! Do you use the paddle attachment for the stand mixer? All things gingerbread, YES PLEASE! These are mouth-watering good! Cookies in oven , but there is no way using a 1 Tablespoon measure as indicted it will yield 48 cookies so nutritional information is way off. I got 28 using the instructions. They smell wonderful. Love these! They were so easy to make and delicious! This will now be added to my favorite cookie list! Hi there! Is parchment paper a must for this to work out?